Check out this pattern, mate! 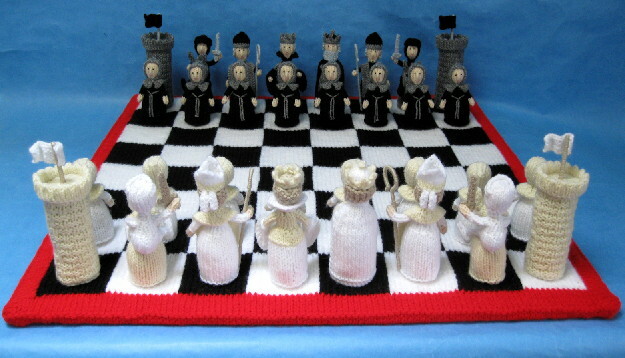 Measurements The board is 221/2in (57cm) square, the Pawn is 31/2in (9cm) tall, the King, Queen, Bishop and Knight are each 43/4in (12cm) tall, and the Rook is 51/2in (13.5cm) tall. You will need Of Hayfield Bonus Chunky 100g balls: 125g each in Black 965 and White 961, and 90g in Signal Red 977; of Hayfield Bonus DK 100g balls: 70g each in Black 965 and White 961, 60g each in Charcoal 837 and Aran 993, and 40g in Flesh Tone 963; of Hayfield Bonus Toytime DK 25g balls: 10g each in Stone 889 and Silver Grey 838; 2yd (2m) length of dusky pink DK yarn; pair each of 4mm (no.8) and 3mm (no.11) knitting needles; 100g of washable toy stuffing; 22in (56cm) square of display board or mounting board; scrap of stiff card; thirty-two 16mm diameter metal hexagonal bolt nuts; four 6in (15cm) white pipe cleaners; four cotton buds; clear adhesive; double-sided sticky tape; pair of compasses; long tweezers; hair spray.